Tweaking your profile on SigningAgent.com takes 10 minutes or less, and pays back dividends. When you upload a professional new head shot or update your E&O insurance, it instantly posts on your Notary signing agent page. Your profile information assures hiring companies that you are certified, competent and you’ve passed the key background screening. Thousands of title companies, signing services and other potential employers search the website each week, and an engaging up-to-date SigningAgent.com personal profile also makes it easier for them to find you and contact you promptly for assignments. If you have a personal website, you can also list that under the Content Information section, where prospective employers can review your specialties and qualifications. 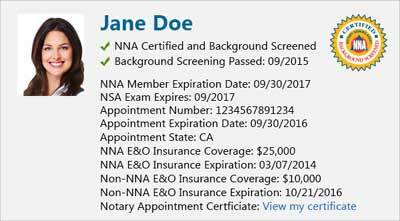 If you are currently an NNA Certified Notary Signing Agent, it’s a simple matter to revitalize your profile through the NNA website. To update your profile using our newest features, log onto NationalNotary.org using your email address and password. Select “My Signing Agent Profile” from the left menu. Click on “edit” in any of the sections to update your profile information and get listed in the SigningAgent.com directory on the NNA website. Save all new entries and keep your NSA profile up to date. Your listing is good for one year from the date you received your NNA certification. To find out more about becoming an NNA Certified Notary Signing Agent, contact our Customer Care Team at 800-876-6827.